Whether you have naturally dry hair or it is dry due to environmental or styling damage, you can soften your tresses and add shine. Dry hair can be dull, lifeless, frizzy and brittle, so proper and gentle care is key to reduce breakage, eliminate split ends and keep your dry locks as healthy as possible. 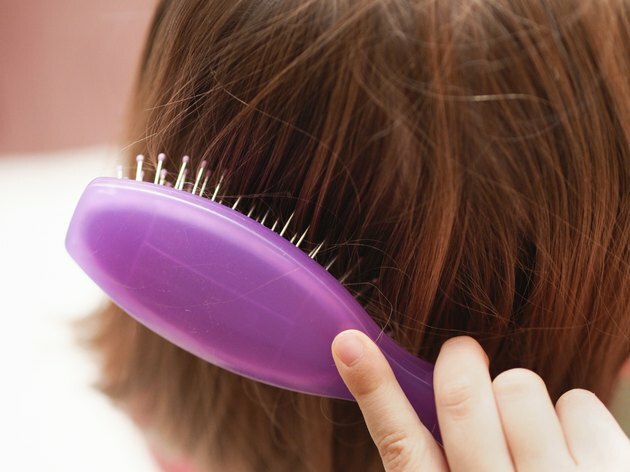 Shampoo your scalp rather than the length of your hair. Use a shampoo designed for dry hair, and shampoo only when essential. Try using conditioner alone between shampoos to freshen your hair without stripping away natural oils. Use a rich daily conditioner. Choose a conditioner with moisturizing ingredients -- such as shea butter, coconut oil or avocado oil -- and protein-based components such as silk or soy protein, recommends NaturallyCurly.com. Work the conditioner through the length of your hair, focusing on the ends and hair shaft. Comb through your hair with a wide-tooth comb or your fingers to gently detangle your locks. Apply a deep conditioning treatment at least once a week. After shampooing, gently blot excess water from your hair, then work a deep conditioner through your hair. Leave in place for three to five minutes, or as suggested by the manufacturer. Rinse well with cool water. Treat your mane to coconut oil. Coconut oil adds moisture and can prevent protein loss. Apply liquefied coconut oil to your hair, focusing on the ends. Wrap your hair in plastic wrap or cover with a plastic shower cap. Leave the oil in place for 15 minutes to one hour, then wash away. Allow your hair to air dry whenever possible and limit rough handling. Choose alcohol-free styling products designed for dry hair and finish your style with a shine-enhancing serum or oil for softer hair.